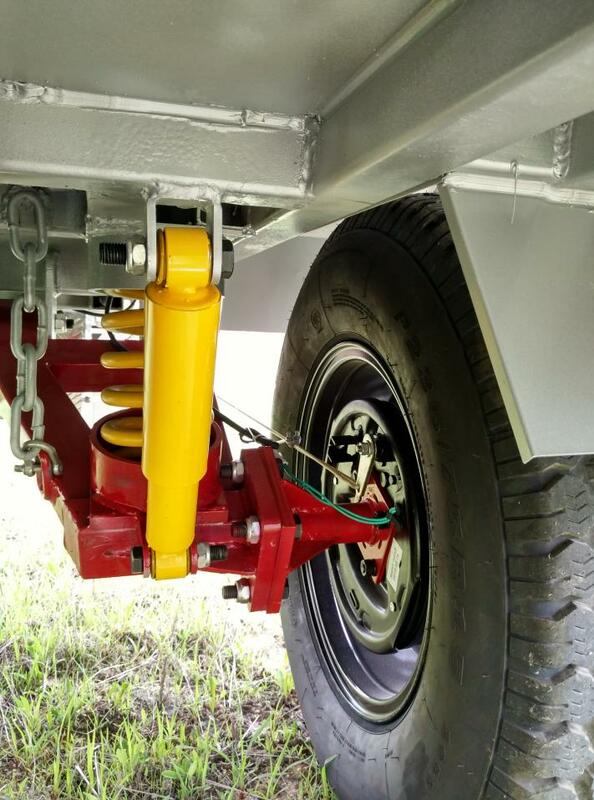 All CRUX trailers have dual Independent , Trailing-Arm style Coil-Sprung Suspension system includes heavy-duty spring rates and gas charged shocks to comfortably and confidently carry all of your equipment and gear. Crux trailers roll on beefy 33" All Terrain Tires mounted on 15" alloy wheels and even includes a matching spare! And with 25" of ground clearance, you can be sure that the CRUX 1610, CRUX 2700 & CRUX 3100 will roll up and over anything your vehicle can. You read that right; CRUX 1610's Euro-Queen Size Foam Mattress is guaranteed to impress even the most epicurean adventurer. And the sleeping chamber can be partitioned off from the entry port / changing room for maximum seclusion. CRUX 1610's sleeping chamber also has three large windows with extendable awnings to allow as much, or as little, air flow and ventilation as you want. And just like the entry port, all windows have a critter-proof mesh screen. CRUX 1610's fully enclosed entry portal / changing room not only gives you a dry and secluded area away from the sleeping chamber, but the portal and window screens are critter proof, allowing you to enjoy the breeze without unwanted guests. Every opening on CRUX 1610's tent and annex is double layered; The outer layer of each window and the entry portal is made of the same 15oz Heavy Duty Canvas as the rest of the tent and annex, and can be rolled up and stored away, or extended out with easily installed supports for a weather and wind proof awning. 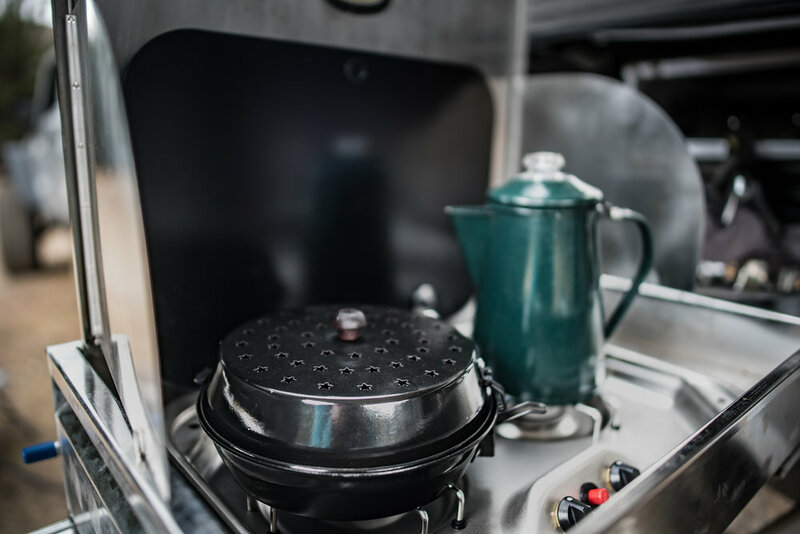 CRUX 1610 features a fully functional Chef's Galley, including a 2-Burner Dometic Propane Range with an extendable stainless-steel Prep Table and a Prep-Sink. There is also a 110 volt grounded outlet to run basic kitchen appliances along with USB ports. CRUX 1610 features a standard, central slide-out drawer for a large cooler or Fridge / Freezer. 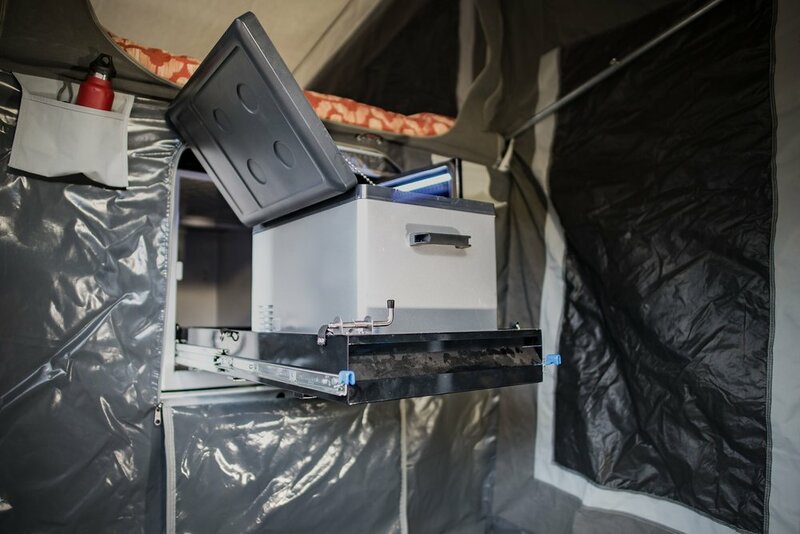 This compartment is accessible through the tent's entry portal and features standard LED lighting. CRUX 1610’s forward mounted water tank aids in maintaining a low center of gravity for an optimal towing experience, both on and off-road. The 65L (<18gal) water tank is covered in a diamond plate steel skid plate to guard against punctures on the trail, and is backed by an electric water pump. CRUX 1610's storage options are vast. With nearly 8 cubic feet of Tool Storage in the forward compartment, numerous lockable slide-out cargo drawers, and the cavernous central storage that houses the Fridge / Freezer or Cooler, there's somewhere secure and weatherproof for all of your equipment and supplies. CRUX 1610's chassis includes extendable struts that stabilize the trailer, ensuring uncompromising comfort, all night. They can also be used to level the trailer if you're not parked on perfectly flat surface.